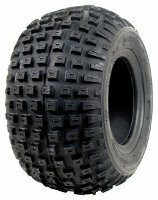 Light weight tyre available in 2 & 4 ply rating Nylon casing with rounded profile. Strong Nylon casing gives improved directional stability & flat resistance. It’s all round profile works excellent on hard packed & loose terrains. All purpose, dimpled knob design gives excellent traction in loose & hard packed terrains. Its natural rubber compound increases puncture resistance & extends tread life.